The OASE Cluster Eco 15-38 Fountain Nozzle can produce a vertical plume of water of up to 10 metres (33ft) tall when coupled to a suitable fountain pump. 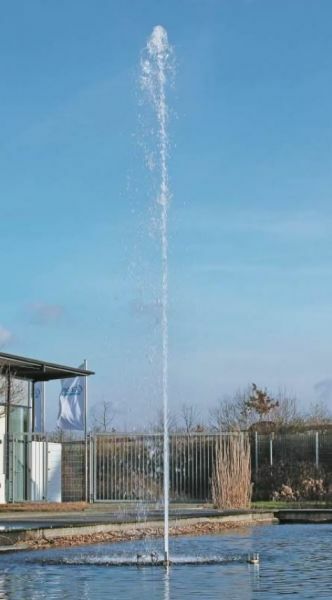 The innovative stainless steel nozzle uses 21 individual jets of water to create one single jet of water around 38mm in diameter, consuming far less water than conventional single jet nozzles. 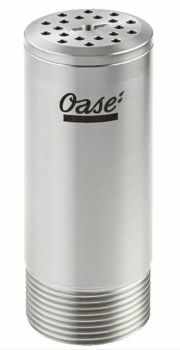 Special OASE deflecting blade technology ensure the water jets fire as vertically as possible with the minimum of outward spray. The Cluster Eco Nozzle looks stunning when illuminated (we recommend the OASE Power LED Spotlights) and due to the 304 Stainless Steel construction, the attachment can be used in both fresh and mildly chlorinated water applications.